In the late 1860’s, hazards created by the Middle Ground Flats opposite the City of Hudson made navigation of the Hudson river at that point extremely risky for the busy shipping route. 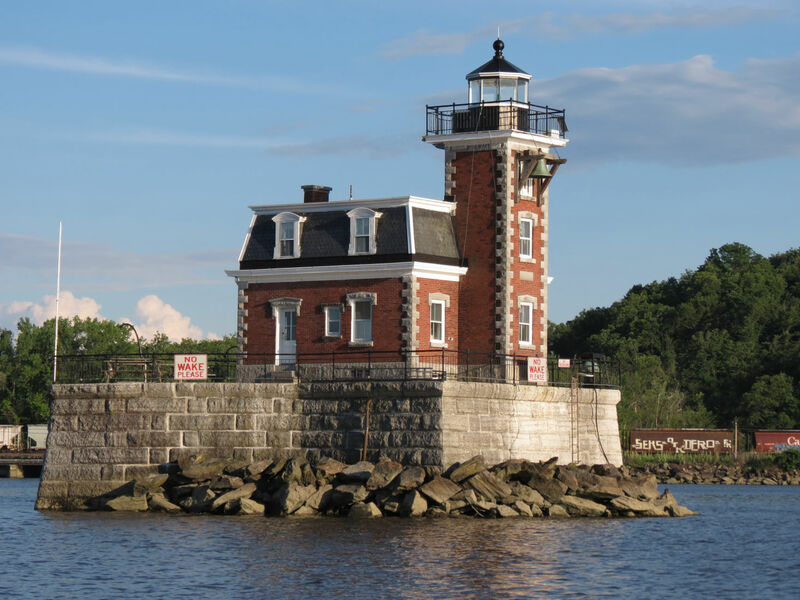 After much petitioning to the Congress of the United States, a survey was completed and an appropriation of $35,000.00 was approved by Congress in 1872 to build the Hudson City Lighthouse now known as the Hudson-Athens Lighthouse. Construction was begun in early 1873, and the lighthouse was completed and put into operation on November 14, 1874. The facility served as a manned lighthouse until the 1950s at which time the lighthouse was automated and a named facility was no longer a necessity. Today, the Lighthouse still serves an aid to navigation, guiding ships safely around the Middle Ground Flats. Since its opening, the Hudson-Athens Lighthouse has been operated and maintained by the United States Coast Guard. However, in 1967, then Governor, Nelson A. Rockefeller, established the Hudson River Valley Commission to explore possible uses for the Hudson River Lighthouses. The Commission recommended that the Coast Guard deed over or lease the facilities to public or not-for -profit groups. These groups would then rehabilitate, maintain and operate the facilities for public benefit. Not until 1982 did any local group seriously attempt to follow through with the recommendations of the Hudson River Valley Commission. In 1982 a group of citizens from Columbia and Greene Counties formed the Hudson-Athens Lighthouse Preservation Society., Inc. 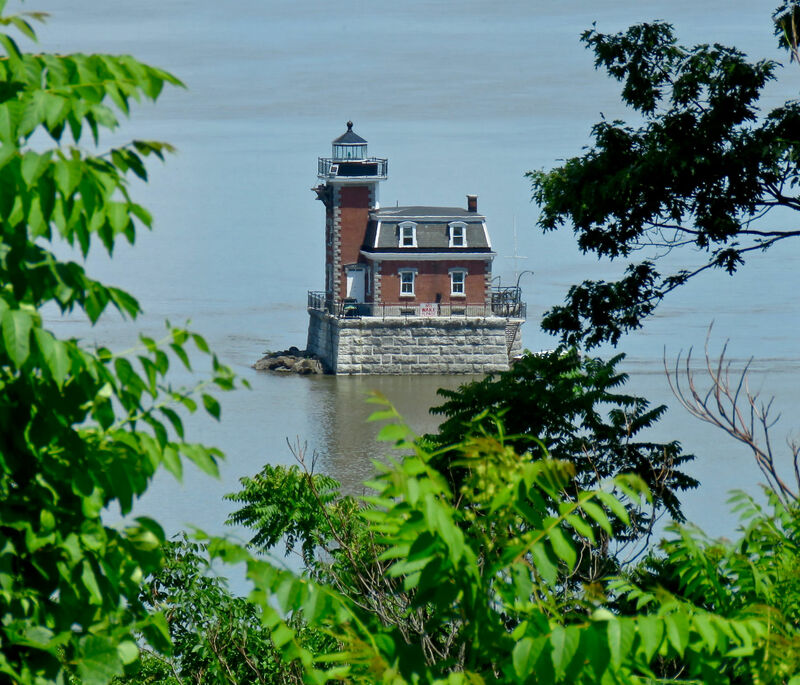 Since then, with private donations, public grants, and legislative initiatives, the Hudson-Athens Lighthouse Preservation Society has undertaken the analysis and mitigation of structural, aesthetic, interpretive and public access issues that face the property. A landmark lease was signed on February 15, 1984. The 20 year lease was between the Lighthouse Society and the U.S. Coast Guard. 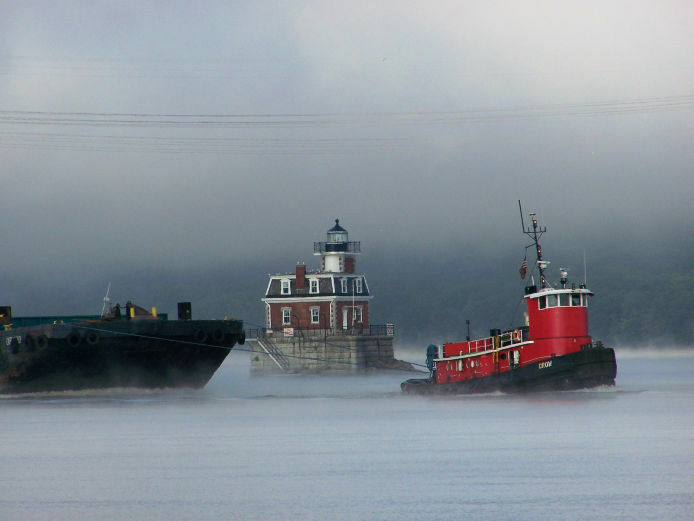 It was the first lease signed with a government agency and a private group for a Hudson River Lighthouse. The Lighthouse Title was transferred as part of the Congressional Appropriations Act of 1999. The U.S. Coast Guard officially transferred the deed to the Hudson-Athens Lighthouse as of July 3, 2000 making the members of the Hudson-Athens Lighthouse Preservation Society its sole owner. 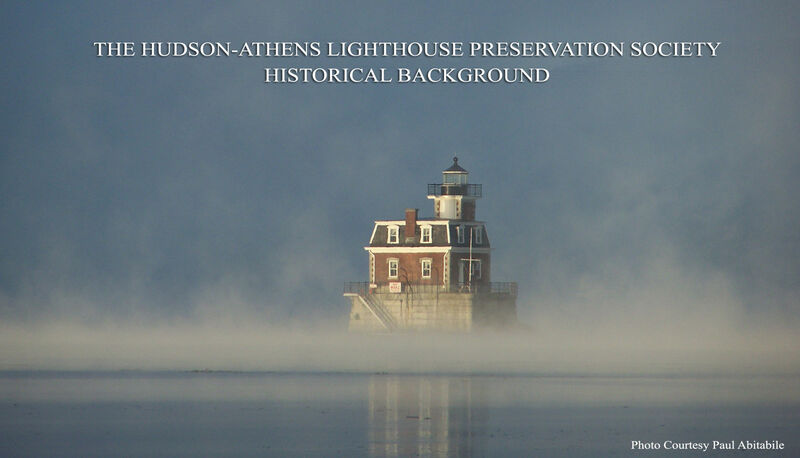 The Hudson-Athens Lighthouse Preservation Society, Inc. is a private, not-for-profit 501(c) 3 organization comprised of members from Columbia and Greene Counties, and neighboring counties and states. The Society is responsible for the restoration, preservation, maintenance and operation of the lighthouse. The lighted beacon remains the responsibility of the U. S. Coast Guard. To encourage the use of the site as an open air studio for artists and photographers, and as a seasonal site for special events. Henry Hudson was commissioned by the Dutch East India Company on January 8th, 1609 to find a passage to the “islands of spicery” that would eliminate the lengthy and expensive voyage around Africa’s Cape of Good Hope. Provided with an 80-ton ship, the Half Moon, and a crew of twenty, Hudson embarked on his journey in early April of that year. In vain, Hudson explored the shores and tributaries of both Delaware Bay and Chesapeake Bay searching for a northwest passage. Not ready to give up quite yet, the crew then sailed north and anchored off the island of Manhattan on September 12. During the next several days, Hudson sailed up the river that now bears his name, traveling as far as Albany before shallow waters convinced him that this waterway was not the fabled passage either. Over a century later, a town bearing the name Hudson was established along the river of the same name. A group of whalers on Nantucket, fearing that England would reclaim her colonies, decided to move their business inland. After sailing one hundred miles up the Hudson River, they selected a site on the east bank of the river for their new home. Directly across the river from Hudson, the city of Athens, which would become a shipbuilding town, was subsequently founded. Together, the cities became an important and busy port on the Hudson River during the nineteenth century. Midstream between the cities was a large mud flat called Middle Ground Flats that was completely submerged at high tide. Many a ship found herself unexpectedly stranded on the flats, prompting Congress to appropriate $35,000 in 1872 for construction of a lighthouse to help ships avoid the obstacle. Work on the lighthouse, officially called the Hudson City Light, began in 1873. Pilings were driven fifty feet into the riverbed and then capped by a granite pier. In order to protect the foundation from winter and spring ice floes, the north end of the base was shaped like the prow of a ship. A two-story, Second Empire style brick structure, similar to the Stepping Stones Lighthouse, was completed atop the granite foundation, and Henry D. Best lit the beacon for the first time on November 14 , 1874. The light shown from a focal plane of forty-six feet above the river and was upgraded to a fifth-order Fresnel lens in 1926. Keeper Henry Best performed several rescues during his service. After Henry Best retired, his son, Frank, took over as keeper and continued his father’s practice of helping vessels in distress. In 1912, as Frank Best was performing his duties, he heard a large crash near the lighthouse. He soon discovered the source of the noise - a collision between a tug and the passenger steamship Isabella. Instinctively, Frank jumped into his rowboat and rushed to help. Due to his quick response, Frank was later credited with saving the lives of eleven people. Emil J. Brunner kept the light from 1930 to 1949. For the first seven years, Brunner and his family lived at the lighthouse, but as the children grew older, the family moved into a house in Athens. Each night, Brunner would then row out to tend the light. In 1946, an artist for the Saturday Evening Post had the family pose at the lighthouse for its December 28, 1946 cover. The painting shows Brunner rowing to the lighthouse with his son and a Christmas tree on board. The rest of the family (with the artistic license of a few extra children added) is shown standing on the lighthouse deck anxiously awaiting their arrival. Brunner, the last civilian keeper at the lighthouse, retired in 1949 when the light was automated. Hudson-Athens Lighthouse Preservation Society (HALPS) was formed in 1982 to preserve and maintain the lighthouse. The U.S. Coast Guard leased the property to HALPS in 1984, while retaining responsibility for the upkeep of the beacon. On July 3, 2000, the title to the lighthouse was transferred to HALPS, a fitting reward for their dedicated efforts. HALPS has restored the interior of the lighthouse to represent life in the 1930s, when the Brunner family lived there. Many authentic pieces donated by the Brunner family are on display, and the original fog bell, which still has its clockwork mechanism, is mounted outside on the tower. There were several keepers that were stations here at this lighthouse over the years, the last civilian keeper being Emil Brunner. Our restoration efforts have focused upon the years in which he and his family lived at the lighthouse. This small room here on the first floor was his bedroom, as he had to be up several times during the night to check the light and refuel the lantern. The oil or kerosene for the lantern was stored in the basement and had to be brought up to the lantern room. The partial lens you see on the floor is one similar to that which would have been here. The original lens is in the South Street Seaport Museum in New York City. Emil Brunner, the last civilian keeper was here from 1932 until 1949. The last person to tend the lighthouse was William Nestle, who oversaw the operations of the light and fog signal from 1966 until 1986. The first keeper was Henry D. Best. He kept the light until his death in January of 1983 and was succeeded by his son, Frank. Through the years the lighthouse had nine light keepers including one woman, Nellie Best, for a short time in 1918. The kitchen was the heart of the lighthouse, something was going on here a good part of the day with the preparation of meals, baking, and of course coffee. As was everything in the lighthouse, cooking methods were rather primitive. The coal stove meant that it was nice and warm in the winter bur a bit toasty during the summer months. Water was collected from the roof into a cistern located under the kitchen. It was then pumped by hand when needed, using the old fashioned hand pump on the sink. There was no indoor plumbing until 1938 when a bathroom was installed inside the lighthouse as well as a central heating system that was run by a coal furnace. Up until then there was an outhouse that hung out over the river just to the right of the flagpole. A fun experience in the winter for sure. Laundry was done by hand in the old days, but the Brunners had an old gas engine washing machine. Ironing was done with a cast iron flat iron that was heated on the kitchen stove. The next room was the dining room. What a view for dinner! Today in this room are some Hudson River memorabilia in the display case along with a replica of a Keeper's hat and badge. In the corner is a reproduction of a Lighthouse Service blanket. Originals of these items in good condition are very hard to come by and are very expensive to purchase. Will my harp and my crown be made of pure gold? These items as well as other supplies came from a central warehouse called a Lighthouse Depot, which for the Hudson River lighthouses was located on Staten Island. The second floor has four rooms that were used as bedrooms. The Brunners had five children, four of which lived at the lighthouse until the family moved into the Town of Athens in 1938. They were Emily, Richard, John, Robert (who was actually born in the lighthouse), and Norman who was born after the family had moved into town. Mr. Brunner of course remained at the lighthouse, while the rest of his family lived in town. Raising four children in such a confined space must have been no small challenge. It is hard to imagine not having a yard or streets to walk down or other children to play with. We are going to use these rooms on the second floor to interpret river life around the lighthouse and the waterfront industries of both Hudson and Athens. You will find some pictures of the children who lived here as well as some enlarged copies of old postcards from the Hudson and Athens area. The larger bedroom has some displays and pictures of boats that operated on the river. Also in the small room you will find a display of all the lighthouses, which were on the Hudson River - both past and present. This is where the actual light of the lighthouse was. Before modern technology and automation, the keeper would have to keep the light shining. Every night he would have to light the lamps and make sure that they burned brightly and did not run out of oil. This usually meant several trips a night up and down the stairs. During the hours of darkness, the "light" was never to go out and if the Lighthouse Service received complaints that the light was not lit or that it was poorly lit, the light keeper would be in danger of losing his job. In the morning he would have to clean the soot from the lantern room, clean the lens, polish the brass, and make the lamps ready for the following night. This had to be done everyday. The lantern room as well as the entire lighthouse was subject to periodical inspection by a Lighthouse Service District Inspector. If all were not in ship-shape condition the keeper would be written up and warned. If the lighthouse continually did not meet the Lighthouse Service standards, the keeper would be replaced. However if all were well, he would receive praise and usually a written commendation. The Lighthouse Service had very strict regulations as to how a lighthouse should be kept. The original light of this lighthouse was a fixed light, which was changed to a flashing light in 1926. It was a fifth order lens, being one of the smallest, but could still be seen as far away as one needed on the river. The light is 54 feet above sea level. Today the light is automated and is turned on at night by means of a light sensor. It is solar powered and maintained by the US Coast Guard. The first fog bells were rung by hand, but around 1860, the Lighthouse Board installed mechanisms to ring them mechanically. Engines were used at first, but the "clock work" system as we have here (where the falling weight is the source of power) was soon adopted, as it was both more practical and reliable. The Hudson/Athens fog bell with the "clock work apparatus" is one of the few remaining in the United States. It rang once every fifteen seconds. The fog bell chores of the light keepers improved with the installation of semiautomatic ringing mechanisms. The system here in the lighthouse is a weight and pulley escapement system that used weights that could be "wound" to start a timed session. Not unlike a grandfather clock, the system needed to be periodically rewound to insure that the fog bell continued to sound throughout the duration of fog conditions. Should the escapement mechanism fail, the keepers then had to sound the bell manually, and at timed intervals and for the duration of the storm or fog. Consider the conditions of this effort between the hard and seemingly endless labor and the close-by clang of the bell. This dedication to duty and to the safety of others is a landmark of the US Lighthouse Service and its successor, the US Coast Guard. By the 1920's the Lighthouse Service had developed electrically operated bells. The bell by the front door of the lighthouse is an example of this type of fog bell. The US Coast Guard installed it in the 1940's. Today, sirens along with diaphones and diaphragm horns are the principle sound-type fog signals used in the United States. The last thirty or forty years has seen the development of the soundless fog signal: the radiobeacon and GPS (Global Positioning System), which uses satellites orbiting the earth to pinpoint your position. From the lantern room if you look to the north you will see an island. This is the "middle ground flats" and the reason for the building of this lighthouse. In the mid to late 1800's this was just a mud flat, which was completely submerged at high tide. Many boat captains had wished that the lighthouse had been built much sooner as many ships found themselves grounded on the mud flats. Through the years with dredging and the depositing of the silt, the "mud flats" have become an island. The main channel of the river is to the right, East, of the island towards the City of Hudson. The channel on the left, West, of the island towards Athens is navigable only for smaller boats. The city of Hudson was a well-established river port being founded in 1784 as a whaling port by a group of Nantucket whalers who relocated from the coast. They had feared that England would retake the colonies and wanted a safer place to run their whaling industry from. Hudson was one of several whaling ports on the Hudson River. It was also a stop for the Hudson River Dayliners, which carried thousands of passengers up and down the river form Troy to New York City. Athens was a shipbuilding town. Many ships and boats were built in Athens including the 281-foot Kaaterskill, which ran for over thirty years between New York, Catskill and Hudson. The Athens Shipyard, the Clark Pottery, the Every & Eichhorn Ice house, and the Howlands Coal Yard were among many businesses that were located in Athens. These and other industries on the river all shipped their goods by boat. Many of the waterfront buildings were destroyed in the fire of March 23rd, 1935. There were also a number of ferries that ran from Athens to Hudson from as early as 1778 until the 1940's. The ferryboats were doomed by the opening of the rip Van Winkle Bridge in 1935. All this combined with the hundreds of sloops, steamships, and barges that went up and down the river made this a very busy area on the river. In the earlier days of navigation the lighthouses on the Hudson River were shut down for the winter season, usually from December to March as ice made the river impassible. During the winter the keepers would often engage in some seasonal employment to supplement the low wages that they received as a lighthouse keeper. Helping with the ice harvest was a common form of employment as the keepers lived on the river. But in later years the Coast Guard kept the river open with the use of icebreakers. Then the lighthouses remained operational all year. These images are reproductions created by the Library of Congress as part of its American Memory Series, an ongoing effort to document important historic structures. Use of this material is potentially subject to copyright despite having been created for the National Government.